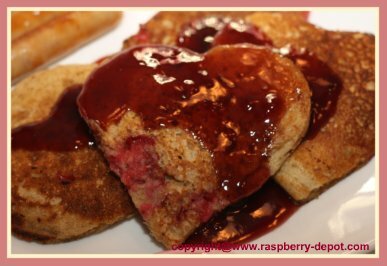 This Gluten Free Raspberry Sauce Recipe is a quick and easy to make gluten free topping made with jam and maple syrup for pancakes, ice cream, cheesecakes and more! There is no need to go through a lengthy process to create a delectable raspberry sauce or syrup ... seedless raspberry jams, (purchased or home-made) have all the flavour you need! Prefer Strawberry or Blueberry gluten free sauce? ... Simply follow these simple instructions using gluten free strawberry or blueberry jam as a substitute for the raspberry jam! In a small microwaveable bowl, stir the raspberry jam and the maple syrup together to combine. Heat mixture in the microwave at medium-high setting at 20 second intervals, stirring each time, until the raspberry jam is melted. Delicious served on pancakes, ice cream, pudding, or fruit.